There is just something about living on a farm! The country air and the animals! You may live on a farm or maybe you would love to live on a farm…you can have the look of a little farmhouse no matter where you live with this cute 4 Inch Dairy Cow tile. Creating a backsplash or fire place surround with several of these Dairy Cow tiles is a cute way to add a pop of color to your farmhouse and white subway tiles. Add the Dairy Cow tile to her other farm friends to bring home the whole farm! 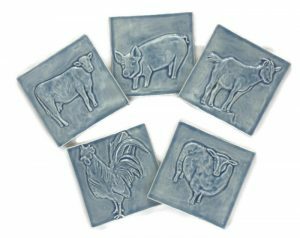 Incorporating the Dairy Cow tile into your tile installation will bring in the quaintness of a country farm to your home. Crafted from stoneware clay, we high fire our tile to almost 2200 degrees for durability. Our tile is 1/4 inch in thickness to pair beautifully with natural stone, commercial tile and our Fire Creek field tile. Every tile is hand crafted just for you, so please allow 4-6 weeks for delivery. You can have unique custom hand crafted tile that no one else on your block has. Order Fire Creek Tiles today! A lazy Dairy Cow outstanding in her field! She is a sweet, little 4 Inch Ceramic Tile. Consider a whole herd of lazy Dairy Cows or perhaps bring home the whole farm and pair her with the pig, the sheep, the rooster and the goat. Beautiful in sky blue or soft celadon green and paired with white subway tile for a pop of color and whimsy. Each tile starts as a slab of clay, hand carved and cast in plaster. Take a moment to read about our tile process, HERE. We craft every tile just for you, so please allow 4-6 weeks delivery. We have several glazes in our shop for you to choose from. A variety of colors to match any tile installation and décor. We can help you achieve the look of your dreams. Do you have questions? You can find answers to our most asked questions, HERE.